Pure-shift NMR has become more and more common over the last few years. A special issue of Magnetic Resonance in Chemistry has recently been dedicated to developments in these methods. Pure-shift NMR methods offer simplified proton NMR spectra free of 1H - 1H coupling. These methods have been extended to proton detected 2D NMR measurements, yielding 2D data sets with higher proton resolution compared to conventional 2D measurements. 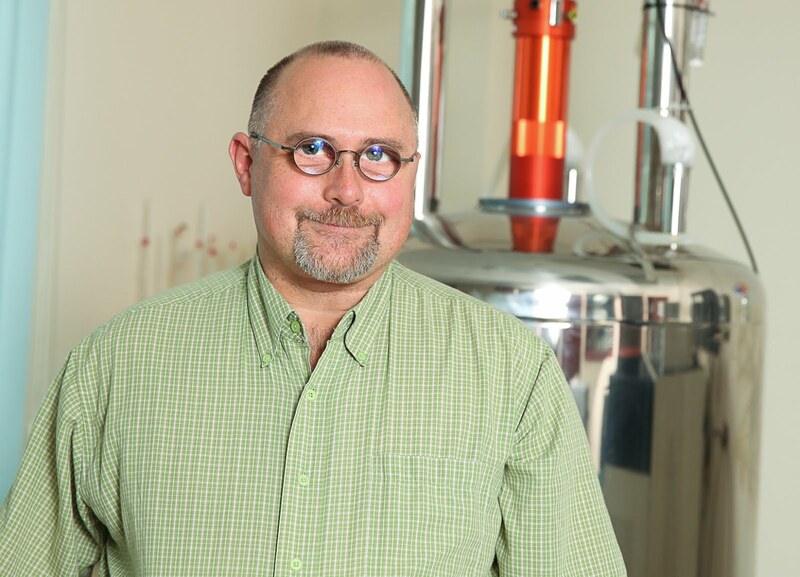 The NMR Methodology Group at the University of Manchester has been a primary contributor to this technique and has kindly shared their efforts on-line. 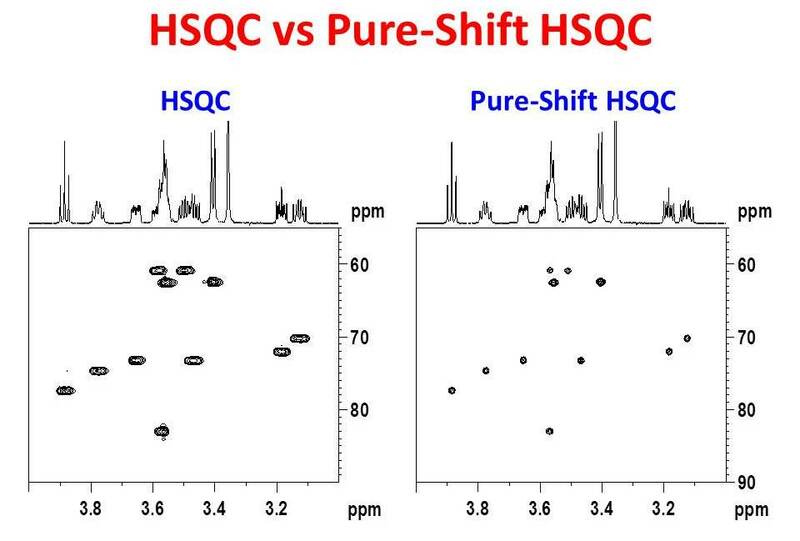 The figure below compares the 600 MHz partial Pure-Shift HSQC spectrum of sucrose in DMSO-d6 to a more conventional HSQC spectrum acquired under similar conditions. The projections on the spectra are independently collected high resolution 1H NMR spectra. 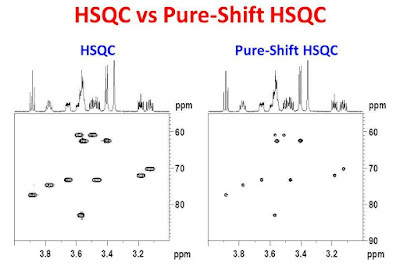 Clearly, the Pure-Shift HSQC data have higher 1H resolution than the more conventional HSQC. What may not be so obvious from the figure is that the sensitivity is also improved in the Pure-Shift HSQC. The gain in signal-to-noise-ratio depends strongly on the degree of coupling collapsed. For some signals in this spectrum, an improvement in the signal-to-noise-ratio as high as 72% was observed. 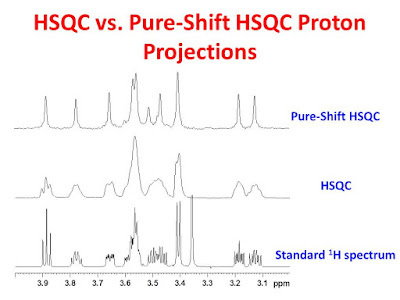 The the top and middle panels of the figure below show the 1D 1H projections of the Pure-Shift HSQC and HSQC data from the above figure, respectively. The bottom panel is the conventional high resolution 1H spectrum for comparison. 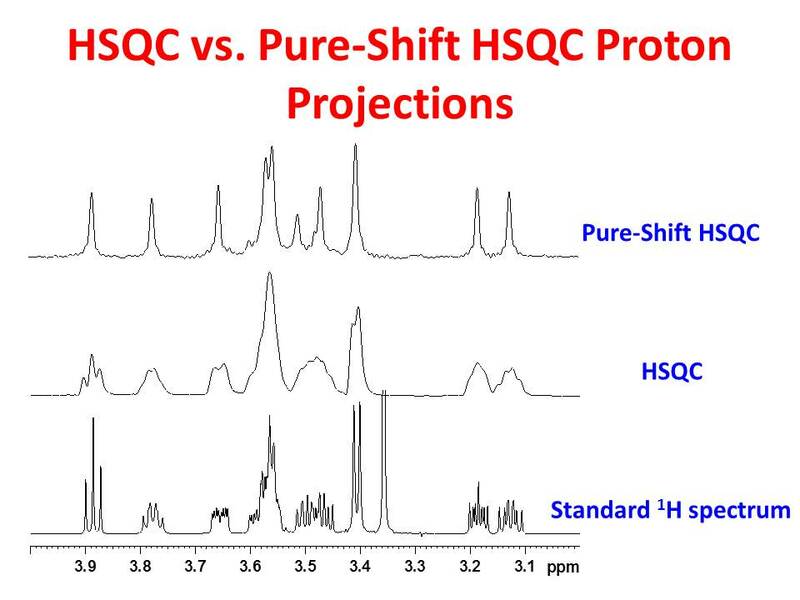 Clearly, the Pure-Shift HSQC proton projection offers much improved resolution. Does the increased S/N ratio gained by the collapse of multiplets compensate for the loss in sensitivity normally associated with Pure-Shift experiments? In my limited experience with this method, I find that the SNR gain attained in the Pure Shift HSQC due to the collapse of 1H-1H coupling compensates any other loss in SNR associated with Pure Shift methods. The gain in SNR is however signal dependent. Your question may be better directed to the NMR methods group in Manchester. In this case the only losses are due to relaxation during the refocusing blocks and imperfect refocusing. The BIRD pureshift works by selecting only the protons bonded to 13C and decoupling them from those bonded to 12C, but in the HSQC you already only see the 13C bonded protons so there is in principle no loss. So in practice for CH/CH3 protons the overall gain in S:N is significant. For CH2 protons the gain is usually less because the 2J coupling remains, but in my experience you still don't really lose anything compared to the non pureshift version. This is in contrast to the 1D case where compared to a simple proton spectrum you really lose a factor of 100 for BIRD and significant but usually rather lower factors for e.g. PSYCHE. You really need a multiple of 2 scans for the pureshift version, whereas 1 scan is usually OK for the non-SI sequences without pureshift. So the minimum experiment time is usually longer, and the signal:noise per unit time may not be as much higher as you would guess by comparing otherwise identical pureshift and non-pureshift versions. Thank you for your thoughtful and informative response.